As you have probably gathered from all my past posts I am totally obsessed with table settings and collecting all things to do with entertaining. One collection of mine that has grown quite large over the of years is my love of the colour amber and all things golden. 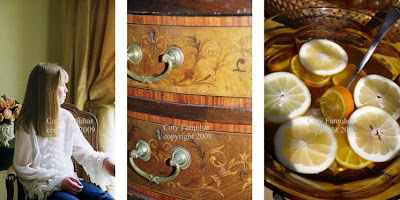 The colour is so rich and so beautiful, the colour of bamboo, walnut furniture, brandy in old decanters, gilt mirrors, beautiful golden embroidery and lemon taffeta silk. 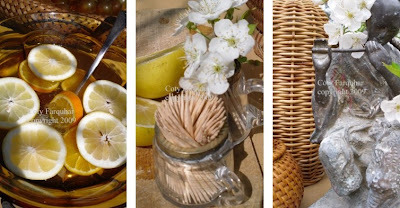 The softest yellows with touches of burnt orange fabrics and lacquered picnic cane ware. 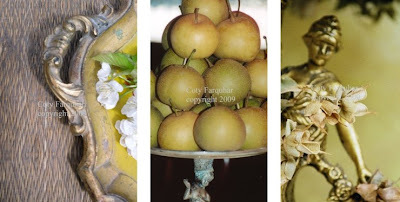 I adore vintage Asian objects and I have a few old pieces throughout my home. I collect coloured glassware, jugs and decanters of many different shapes and designs. 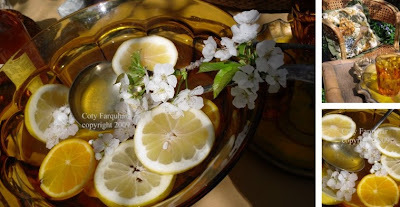 The mix of all these colours blend so beautifully together and with my large amber glass bowl filled with chilled Sangria with lemons, limes and oranges floating together I think this look is just gorgeous. I know it is the one colour that I can to use through every season, it just blends so beautifully. This table setting is in my front garden under my Cherry tree. 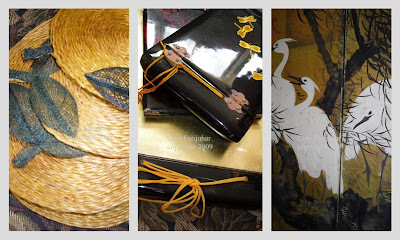 I had a large pile of straw hats for everyone on the table and a couple of Chinese lacquered paper umbrellas. 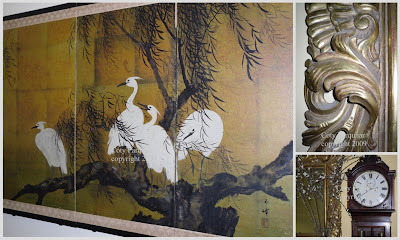 I love this old chinese screen with the white birds, I bought it from a great friend of ours and it belonged to her Mother. The gold background is gorgeous and I have it hanging on the wall in my sitting room. My collection of golden colours even extends to these place mats complete with little woven leaves. 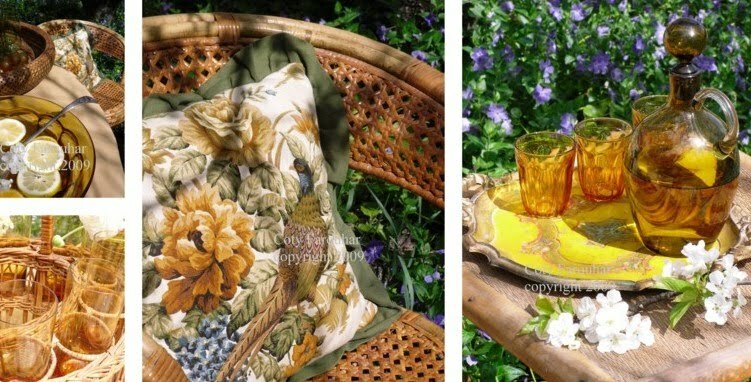 I also found this vintage linen cushion at a garage sale a while ago with the pheasant bird and the beautiful burnt orange coloured flowers. My little Italian tray has the loveliest soft yellow and I hate to say it, but I have a large collection of these as well. I hope one day to have a spare wall in my "one day" Butler's pantry, where I can have them displayed all together in a group. .....I can only wish!! There is a use for everything in my home, I have two little tiny glass salt decanters missing their silver lids, so they now house toothpicks. I have been playing around with my layout this week and lost some of my blog, I almost had a heart attack and I nearly had to start from scratch, can you imagine.!! Anyway after a couple of days of very stressful html trial and error I managed retrieve most of my lost blog. So I sincerely apologise if you were in the middle of reading something and it just disappeared.. Absolutely beautiful, as always. I feel more relaxed each time I visit your blog! Every shade and texture of gold, amber, and yellow! 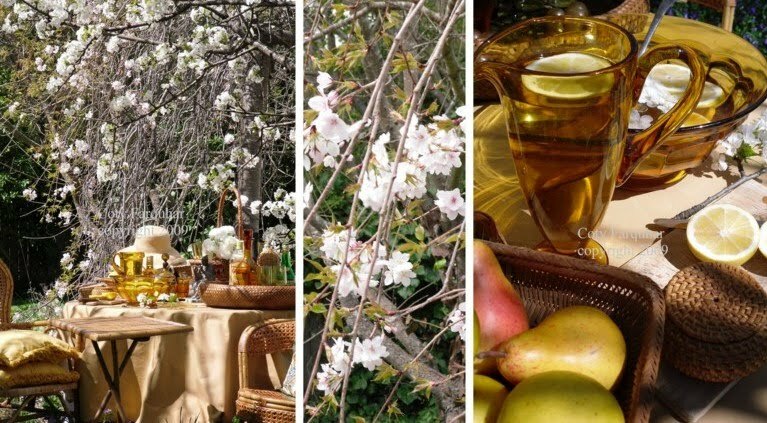 I love how you have shown the colors in everything from fruit to furniture! The tree is gorgeous! Of course, ours here are in your color theme now--beautiful gold, orange, and yellows! Loved my visit! Coty, spectacular job! I really love your style and the colors you have used for this setting is wonderful! I love all the details! Great job! Yellow is my favorite color, so of course I like the amber colors as well! You have some gorgeous pieces! Such beautiful inspiration here. I felt like I was reading the old Victoria magazine. Everything is lovely as usual. I'm sorry you almost lost your blog! some of the templates erase everything. I always copy and paste my code and put it in my Text Edit on my mac so if things to wacky I can put everything back the way it was before I messed it up! everything looks good at your blog! have a great week! What is great about golds and amber is that it works in any season. Light for summer. Harvest gold for autumn. Sparkling in the candlelight for Christmas. This is one beautiful tablescape! GORGEOUS!!! I may have stolen another phot... I want to sit at that table and have a feast and champagne... do you Mr. Lagerfeld would join us here? His current fashions would fit in! 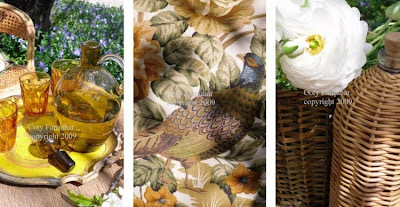 Coty...this post makes me want to go buy everything I can get my hands on...in amber yellow hues. I have lots of yellow walls in my home...so I have a good start. :-) Actually, that's the way I see the warm, golden paneling in my family room...it feels like your beautiful descriptions above. So, I guess I do share your love for that golden amber color. I'm soooo glad you love entertaining because we get to share in all the beauty. 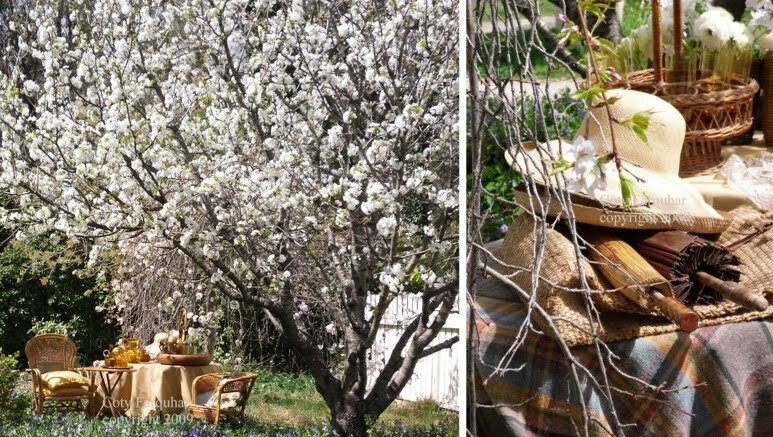 The setting under your Cherry tree is breathtaking! Beautiful, as always, Coty! I collect vintage amber glass too. In fact, I collect almost every color. :o) It's so fallish. Coty.......I love the pictures you take with that tree in the foreground...it's always so beautiful.....and such inspiration! I think I'll have to fill the tea platter with more from now on! Hope you are well - and have a wonderful weekend. Hello, Coty. Simply stunning (as always)! I'm awestruck whenever I visit your beautiful blog. Thank you for the inspiration. I'm so sorry you had to struggle to recover missing elements of you blog ... but glad you were able to save most of it. The thought of what happened to you strikes terror in the hearts of bloggers everywhere. Again, everything is so very beautiful. Thank you for sharing your amazing talent with us. Thank you so much for your wonderful comment to the Skirted Roundtable. I loved it. It's always trying to think what could have been - but it looks like you have certainly made quite a huge success out of your life. Thanks again!